THE hosting of the Dubai Duty Free Irish Open in Donegal has been hailed as a game changer by Cathaoirleach of Donegal County Council Cllr. Seamus O’Domhnaill who said Ballyliffin Golf Club and the people of Inishowen have succeeded in hosting one of the most splendid Irish Open’s in recent history. “This was a wonderful opportunity for Ballyliffin Golf Club and the people of Inishowen to showcase this stunning location to a global audience of almost half a billion people and they surpassed all expectations”. “Almost 95,000 visited Ballyliffin over the five days of the tournament and I have no doubt that this will leave a remarkable legacy for everyone involved. I firmly believe that this is a game changer for Inishowen, for Donegal and for the North West region” said Cllr O’Domhnaill. Cllr. 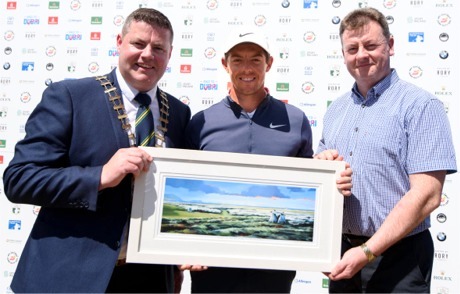 Seamus O’Domhnaill, presenting Rory McIlroy with painting by local artist Sharon McDaid in recognition of hosting the 2018 Dubai Duty Free Irish Open in Ballyliffin with Seamus Neely, Chief Executive Donegal County Council. To mark the occasion of the 2018 Dubai Duty Free Irish Open in Ballyliffin, the Cathaoirleach, on behalf of Donegal County Council presented both Rory McIlroy, host of the tournament and Simon Ellis of European Tours with two paintings by local artist Sharon McDaid depicting the majesty of the Glashedy Links at Ballyliffin. Cllr. O’Domhnaill believes that the underlying secret to the success of this year’s tournament is collaboration and everyone working together for one unifying goal of making this event an outstanding success not just for the organisers but for the people of Inishowen and Donegal. “I would also like to acknowledge the work done by local communities and businesses right across Inishowen. It was clear for everyone to see as they drove through Inishowen over the last few days the pride that local people have in their own communities”. “Finally, I would like to acknowledge the work of John Farren and the members of Ballyliffin Golf Club. They had the foresight, the belief and the ambition to host this world class event and this did not just happen overnight. They have worked for years to achieve this and I know that they want to build on this and to continue to host events of this stature at this stunning location”.